Zotos International Inc., whose parent company is Shiseido is a professional beauty industry leader that manufactures and markets a full range of hair care, texture service and hair color options for today’s salons and salon professionals. They care a bout reducing CO2 emission and aggressively strive to reduce their carbon footprint one step at a time with such innovations as installing a two-turbine wind farm at the site, at their Geneva, NY plant. It is the largest onsite wind project at any manufacturing company in the United States WOW! quantum thermal straightner.. always had straight hair and after menopause it a lot of it came out and come back so so so curly and I hate it.. frizzy too!! I would like to try the Macadamia Oil Damage Recovery Shampoo and conditioner. I would like to try it because my hair is damaged and hope it will help. Quantum Color Protect Shampoo I would love this shampoo to help keep my color looking fresh longer! Shine Boost Rinse-Out Glaze because my hair is dull looking. I want to try the Quantam Thermal Straighter! Gently cleanses & nourishes color-treated hair. I would love to try the Hemp Volumnizing shampoo and conditioner. I have used the Hemp lotion and really like it and my hair needs help with body. I didn’t even know that Hemp made hair care products. Rosemary Mint Conditioner. I would like to have it to give to my daughter so she can use it. Thermal Protect Styling Spray.i just turned 57 and I have always had totally straight!! but two years ago all of a sudden it turned as curly as curly can be!! I have no idea how to manage it.. so I definitely would love to try this to control the frizz!! I would like to try Blow Dry Addict, to protect my hair from heat damage, static, and flyways after drying. I have very straight flat hair and I would like to see if this would help that! I’d like to try the AGEbeautiful permanent liqui-crème haircolor because it has stuff in it to replenish hair! Hairtrition 3-Minute Deep Moisture Treatment, because my hair is thick and dry and needs some help! Would love to try the Firm Hold Hairspray because I have fine hair! 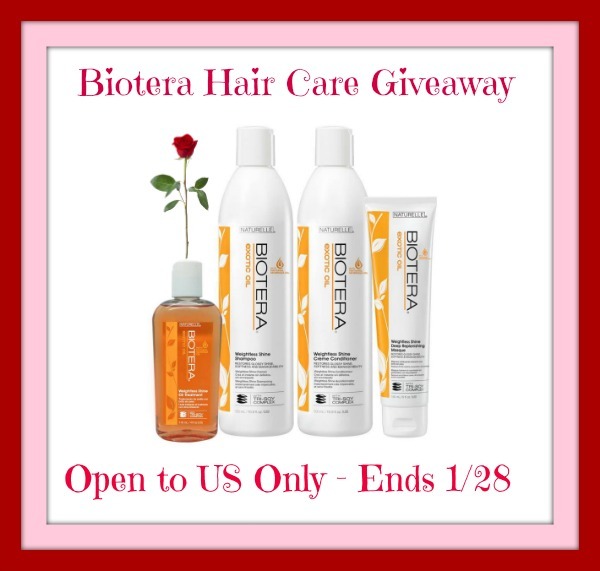 I would like to try the Biotera Thermal Protect Styling Spray to help protect my hair and fight the frizz. I would like to try the 3 minute deep conditioner, my hair is dry and needs it. I love Shiseido! Pick me! I would like to try the rosemary mint conditioner or hemp hydrating conditioner. I would like to try the Nutri-Ox Ampli-Max Thickening Treatment, because my hair is fine. Proteplex Hydrating Conditioner for the moisturizing properties. My hair is dry. I would like to try the hairitron. I would love the Hairtrition Macadamia Oil Damage Recovery Shampoo and Conditioner to help strengthen my hair! I would like to try their volumizing shampoo. I would love the try ‘Nutri-Ox Ampli-Max Thickening Treatment’…i have always had thin, wispy hair so i would try this shampoo in a heartbeat. I’d like to try the AURA pure conditioner because my hair is soooooo dry right now….Arg. I’d choose to try the AGEbeautiful permanent liquid hair color. I like that it’s the 1st anti-aging, permanent, liquid haircolor proven to fight all 5 signs of aging hair. I want to try the Volumax Volumizing Shampoo. My hair is oily & fine, so frustrating. i would love Hairtrition 3-Minute Deep Moisture Treatment, because my hair is very damaged from using a flat iron. I would like to try the Hairtrition 3-Minute Deep Moisture Treatment because I think my hair could really benefit from the moisture, it tends to be really dry. Thank you. I would like to try the Nutri- ox 3B and the rosemary mint hair collection. I would love to try the Nutri-Ox Ampli-Max Thickening Treatment because my hair has really thinned out over the past few years! I actually really want to try the Weightless shine! I would like the Hairtrician for my frizz. The agebeautiful anti-aging permanent liqui-crème hair color is what I would like to try because I have stubborn grey and always have to have a root touch up before I can color again. I would like to try the AGEbeautiful anti-aging permanent liqui-crème haircolor because it sounds better than what I’m using. I would like to try their shampoos and conditioners because I am always looking for new ones to mix in o keep my hair healthy and beautiful! I would love to try their hair color because it is anti-aging haircolor and the first permanent liqui-crème color developed to fight all 5 signs of aging hair. I would like to try the Hairtrition 3-Minute Deep Moisture Treatment. I would like the Nutri-Ox treatment for chemically treated hair, my hair is baby fine and I color it for body. It needs help! I would like to try the AGE beautiful hair color, because it is specifically for aging hair. I would love to try the Volumax Volumizing Mousse because I had straight limp hair and I would love to find a product that could really give me a lot more volume!! I want to try the AGEbeautiful anti-aging permanent liqui-crème haircolor because I just colored my hair with a salon product and my grays are already showing after 1 week! This sounds like a better product to use. Kit for Extremely Thin Chemically Treated Hair. My hair is fine and I color it (infrequently, but still), and these product sound really good…. I would love to try the Hemp Hydrating Conditioner! I’d like to try the hemp volumizing shampoo and conditioner because I have very fine limp hair. Volumax, Volumizing Shampoo. cause I can use all the volume I can get and not have my hair be weighed down! Age beautiful ! My hair needs a makeover! apple pectin shampoo and conditioner. I would love to try their Rosemary and Mint shampoo because I love the smell of both and have heard that both ingredients are good for hair health. I love Apple Pectin Shampoo and Conditioner I would want those 2 things!! I would like to try the Nutri-Ox Treatment for First Signs Chemically-Treated – Step 3A because my hair could really use some help after all of the coloring.